It often pays when noting what is being said, to also note what isn't. Sometimes an omission is as telling as the prose. And so it may be with Mark Webber in his words which followed the confirmation that he's quitting F1 at the year's end in to drive for Porsche in sportscars. Looking into his utterances which followed the Porsche announcement perhaps there are some revelations in there, that the words themselves didn't outline explicitly. Webber has faced criticism of the amount of warning he'd given the team about his impending announcement. Team principal Christian Horner said subsequently that he was only given a few minutes' advance notice that Webber was going to confirm his future with Porsche, while others alleged that the ordinary members of the Red Bull team only found out about it via the media. And later, when outlining what we would miss about F1 Webber, among other things, noted: 'working with people like Adrian Newey'. What's so strange about this, I hear you cry. And you'd be right, as the sentiments shouldn't surprise us in isolation. For all that we talk about Webber being a stranger here myself within the Red Bull organisation, it is known that he has had two key allies there, in the company's big boss Mateschitz and in the Technical Director and design genius Newey. Webber and Mateschitz are very close, indeed Webber often negotiated his deals personally with him. While Newey has always been highly appreciative of Webber's technical feedback. But, to go back to the matter of what was missing, conspicuous by their absence here are a couple of glaring figures. One, no mention of his bête noir Helmut Marko. No surprise here, after all there has for a long time been little secret of the pair's mutual aversion, which came to light particularly over Marko's comments about Webber's strengths and weaknesses as a driver in the close season. Indeed, Webber was explicit on this point at the time, stating: 'Look, everyone at this level has their own agendas and it's been evident for a long time now that I've never been part of Marko's'. The other glaring omission from this though is Horner. 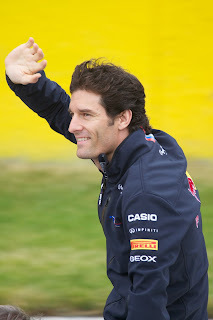 The Webber-Horner relationship has never been as nakedly hostile as that of the Australian with Marko, but there has for a while been suspicions to the effect that the two don't especially see eye-to-eye, be it because Webber views Horner as being to close to the team's Vettel-Marko axis of power, or whatever. And this, in conjunction with the lack of notice of the announcement given to Horner which irked him clearly (and compare it with the notice that Mateschitz got) - may back this up. The man himself denies it, but it could well be that the nature of Webber's announcement of his F1 farewell on Thursday was something of a parting shot. Excellent thank you. Real insight. I find Horner a bit of a disingenuous moaner. My general dislike for him aside, I didnt care for how he went about repeatedly saying "Well Merc have got some advantage out of the tyre test, they were nowhere in Catalunya, then there was the test, and they won in Monaco"
He's said that even after the FIA tribunal into the tyre test, when anybody in his position knows fairly well that Mercs winning Monaco was down to the circuit characteristics not wearing out the tyres , and stifling passing opportunities. Heck, most of us armchair pundits know that ! His blatant attempt to play the F1-watching public through the media, and play us for fools ... dont care for it. Yes, Christian Horner does seen to like his media campaigns doesn't he? We've seen it this year with the Pirelli issue, as well as in the tyre test case you mention. Ordinarily I wouldn't mind so much, but it was Horner, along with Helmut Marko and others at Red Bull, who were getting precious late last year about what they saw as Ferrari's 'politics'! If this isn't politics from Red Bull then what is?